There are many different kinds of beer lover: those who like the warmth of familiarity, those constantly seeking new sensations, those who revel in the technical details. But there are some who also see beer and brewing as an expression of ideas or values. These are the beer lovers who – like the US craft pioneers of the ‘80s and ‘90s – end up taking the industry forward, showing us something new or, at the very least, making us reconsider something we thought we already understood. I’ll stick my neck out and say that Brooklyn Brewery’s Gabe Barry falls into the latter category. Having started out as the brewery’s tasting room manager in 2013, Gabe has carved her own path in the business, winning over brewmaster Garrett Oliver as a mentor and champion along the way, and has just started a new role as the head of Brooklyn Brewery’s education programme in Europe. She’s at this year’s Craft Beer Rising, representing the brewery, pouring some beers and taking part in a panel session on women in beer. Brooklyn Brewery has taken its education programme increasingly seriously in recent years, a fact that Gabe says stems from its earliest days, when ‘speciality’ beer in New York City consisted solely of Guinness. Recognising it would be nearly impossible to push their new beers into such a locked-down environment, Brooklyn Brewery founder Steve Hindy set up his own small distribution company, bringing in competition from other small breweries and effectively creating a market in which his own beers could sell. The programme has undoubtedly benefitted from the enthusiastic support of Brooklyn Brewery Brewmaster Garrett Oliver, who is himself a consummate communicator and beer storyteller. He and Gabe have worked closely to expand the reach of Brooklyn Brewery’s education efforts. Garrett is even actively involved in some of the training activities, in particular ‘Beer School’, a two-day immersive educational programme, which he runs alongside Gabe. It’s aimed at Brooklyn Brewery’s salesforce, including distributors, bartenders and restaurant owners, who converge on the brewery from all over the world. The big finale is a meal, cooked by Garrett himself, for which he accepts no help from anyone not on the production team. This, says Gabe, is as important a lesson about Brooklyn Brewery’s culture as anything else on the course. At the time of writing, Gabe is still surrounded by cardboard boxes, in the process of moving from New York to her new base in Paris. As well as the practical differences in her day-to-day job (she recalls an early tasting in a French beer bar, where she decided to try out some new material: “I was funny, I think, but more in a ‘silent clown’ way”) the move has also clearly got her thinking about Brooklyn Brewery’s place in the world, and the future of craft as a global movement. “One of our co-founders Steve is very active in the Brewers Association, which helps us keep on the pulse of national industry and gives us a global perspective of the industry as a whole. “My opinion is that we are going to see a lot of things happening in the Brewers Association, with respect to reaching a global perspective on what craft is. Because as soon as you leave the United States, ‘craft’ has a very different meaning. As someone who has feet in both worlds, I think we’re going to reach a point quite soon where we all have to agree upon what we actually mean when we talk about craft. CBR 19 is a big festival for Gabe, and Brooklyn Brewery is hoping to make a big splash, with some great beers and active participation in this year’s talk programme. She’s also very happy to be in London, and says the excellent beers and breweries here make it feel like a home away from home. Several beers on the brewery’s CBR line-up aren’t what we in the UK would consider very ‘Brooklyn Brewery’ styles. While it’s true that the brewery is still very proud to be predominantly associated with its flagship lager, its presence at CBR demonstrates it does have other strings to its bow. 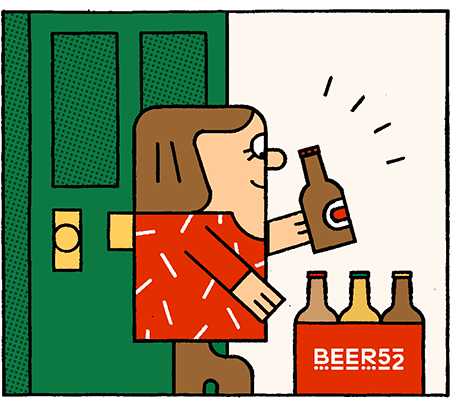 It’s certainly keeping its hand in the IPA game – after all, it’s still the fastest-growing category in the US – with beers like Defender, Naranjito and its classic East IPA, but Gabe explains the brewery’s unease with pursuing that trend too far. But experimentation is happening in other directions, with superb results. Among the beers Brooklyn Brewery has brought to CBR is Bel Air Sour, which has proven both a commercial and critical success for the brewery, with its bright tropical notes and clean, lactic tartness. Tying back to the idea that every beer must be based on rock-solid, thoughtful brewing, Bel Air is a good example of something Brooklyn Brewery probably wouldn’t have put out earlier in its life. Another particularly interesting inclusion is Brooklyn Brewery’s alcohol-free beer (AFB) Special Effects. Clocking in at just 0.4%, it’s a timely brew, given the direction of the market as we come into 2019. It’s a good beer in its own right – well balanced, with a piney bitterness from Citra and Amarillo, and sweet, bready malt base – but also, argues Gabe, a good use of Brooklyn Brewery’s position to drive trends and affect change. “As an American, we have a sh*t relationship with alcohol,” she says. “We didn’t really have alcohol, other than a few places in the south-west, until the Europeans brought it over, and then we have prohibition. It’s been a messy history. So for us, alcohol-free beer is something for alcoholics; it’s sad, not something you’d want to see your friends drinking. That’s changing, and it’s within Brooklyn Brewery’s power to help that change. One of the most interesting sessions on this year’s CBR talks programme promises to be the women in beer panel discussion, in which Gabe will be participating alongside award-winning female brewers. The focus of the discussion will be on visibility, promoting female participation in beer and cider at all levels by ensuring the industry-leading work being done by women is properly recognized and celebrated. ”I’m really interested to be able to support the work that women in the UK are already doing, even if it’s just by being a part of this amazing community. I have serious woman crushes on some of the heavy hitters in the UK beer scene that I hope I’ll get to meet. Obviously Melissa Cole’s writing kind of speaks for itself. But I’m also really looking forward at least trying some of Wildcard’s beer, and it would be so great to actually talk to [head brewer] Jaega Wise.